Better cooking-with-charcoal methods like using mesquite- charcoal produces a much healthier environment, as do other methods as well. When using charcoal, there are techniques you can keep in mind to use which are earth-friendly. Better methods yet, use propane and electricity, which provides a cleaner burning experience. But, if you are currently using charcoal, and MUST continue to use charcoal for barbecuing, try to follow a few simple ways of doing it. Use wood briquettes that are environmentally certified. Natural charcoal is preferred over regular charcoal, which can contain additives and dust from coal. Have you heard of mesquite-charcoal? Mesquite wood is harvested in an ecologically responsible manner, by only using preselected mesquite trees. Mature, heavy and low to the ground branches are taken. Dead and weak wood only is harvested. Fallen wood is included as well. This is all determined after being well surveyed and studied by a biologist well in advance. A report is made on the specific area studied, and the harvest begins. The reason this pre-selection method is so ecologically responsible, is because during the process, nothing is disturbed. Healthy trees and the surrounding ecosystems remain untouched and intact. They are not harmed or threatened in any way. This form of premium mesquite-charcoal is pure. There are no chemicals, additives, fillers or coal. It is pure natural hardwood carefully selected for market, and will serve your cooking-with-charcoal needs well. 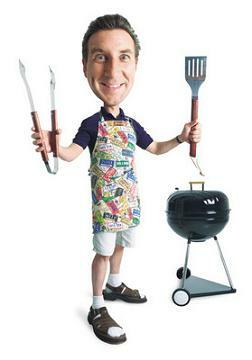 Do not start the grill with lighter fluid or fluid soaked briquettes. They can release volatile organic compounds into the air. If you don't know what this method is all about, or have never done this, take a look at the video. If you can get to it soon enough, your charcoal grill parts can be cleaned with just a little baking soda and water mixture, which contains no chemicals. As always, consider your barbecue menu and shop locally to support your local farmers as much as possible. Leave Cooking-With-Charcoal, Return To Kitchen Carbon Footprint.